Oct. 19, 2017 12:30 a.m. The new intersection at Highway 2 and Highway 53 at Ponoka caused some confusion for one truck driver who took the exit rather than the entrance. 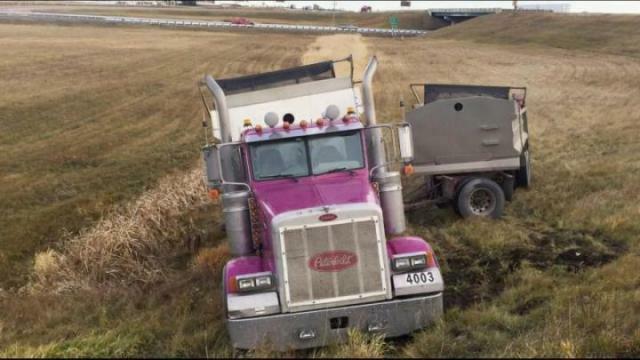 The incident occurred Oct. 19 just west of Ponoka when an Alberta motorist from Calmar travelling westbound on Highway 53 turned onto the southbound off-ramp rather than the entrance ramp of Highway 2. Officers say the truck was westbound on Highway 53 with the intention of going onto Highway 2 northbound. The new intersection is designed so that motorists wishing to take the northbound lanes must enter from the east side of the Highway 2 overpass. There are signs for the entrance. The gravel truck was on the west side of the Highway 2 overpass when it turned into the southbound exit ramp. The driver then realizing the error, attempted to turn around by entering the inside ditch to prevent driving into southbound oncoming traffic of Highway 2. At this point the gravel truck became stuck in the ditch and leaked a small amount of diesel. The Ponoka County East District Fire Department was called to clear the small spill. There were no injuries from the incident but the driver was given a ticket for driving in the ditch, a fine of $155.